São Gabriel da Cachoeira (Agenzia Fides) - The figure of catechists is of particular importance in the Amazon Church, as they are the ones who carry out daily pastoral work in many communities. Agenor Freitas Prado has carried out this service in his community for twenty years. 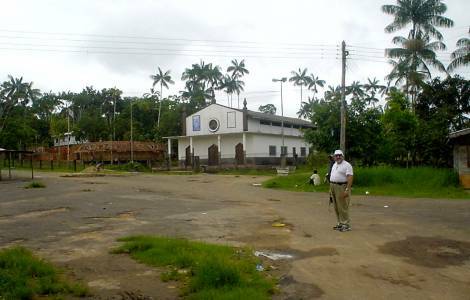 In Boca da Estrada, on the banks of the Tiquié river, near the border between Brazil and Colombia, in the municipality and in the diocese of São Gabriel da Cachoeira, indigenous people of different ethnicities: Tukano, Desano, Piratapuia and Hupda live. Agenor Freitas Prado, speaking to Agenzia Fides, says that every Sunday he presides over the celebration of the Word and guides prayers during the week. The celebrations are in Tukano language, which is the predominant language in the region. Agenor points out the importance of translating "the books of the Mass, the rituals and the prayers, into our language, following the dynamics of the liturgy. We do not have those books, while it would be important to have them", he underlines, since "there are already songs in the indigenous language, it is necessary to move in this direction". In view of the Synod of Bishops for the Amazon and the new paths that the Church wishes to undertake, speaking to Fides, the catechist believes it is important to reflect on how to make the celebration of the Eucharist more frequent in his community, considering the distances and the lack of economic resources to overcome them, the Eucharist is not celebrated more than twice a year. Along with this, the catechist, who belongs to the Desano peoples, recognizes that "the scarce presence of priests means that not only the Eucharist is not celebrated but also the other sacraments, and this numbs the life of the community, as many children and young people do not receive the sacraments of Baptism, Eucharist, Penance or Marriage".